Here we present a cost-effective method for defining chemical-genetic interactions in budding yeast. The approach is built on fundamental techniques in yeast molecular biology and is well suited for the mechanistic interrogation of small to medium collections of chemicals and other media environments. Dilworth, D., Nelson, C. J. Rapid Identification of Chemical Genetic Interactions in Saccharomyces cerevisiae. J. Vis. Exp. (98), e52345, doi:10.3791/52345 (2015). Determining the mode of action of bioactive chemicals is of interest to a broad range of academic, pharmaceutical, and industrial scientists. Saccharomyces cerevisiae, or budding yeast, is a model eukaryote for which a complete collection of ~6,000 gene deletion mutants and hypomorphic essential gene mutants are commercially available. These collections of mutants can be used to systematically detect chemical-gene interactions, i.e. genes necessary to tolerate a chemical. This information, in turn, reports on the likely mode of action of the compound. Here we describe a protocol for the rapid identification of chemical-genetic interactions in budding yeast. We demonstrate the method using the chemotherapeutic agent 5-fluorouracil (5-FU), which has a well-defined mechanism of action. Our results show that the nuclear TRAMP RNA exosome and DNA repair enzymes are needed for proliferation in the presence of 5-FU, which is consistent with previous microarray based bar-coding chemical genetic approaches and the knowledge that 5-FU adversely affects both RNA and DNA metabolism. The required validation protocols of these high-throughput screens are also described. The genetic tools and resources available in the model organism Saccharomyces cerevisiae have enabled large-scale functional genomics studies that collectively provide new insight into how genes function as networks to fulfill the requirements of biological systems. The cornerstone of these tools was the collaborative creation of a complete set of non-essential gene deletions of all open reading frames in yeast1,2. A striking observation was that only ~20% of yeast genes are required for viability when grown as haploids under standard laboratory conditions. This highlights the ability of a cell to buffer against genomic perturbations through the utilization of alternative biological pathways. 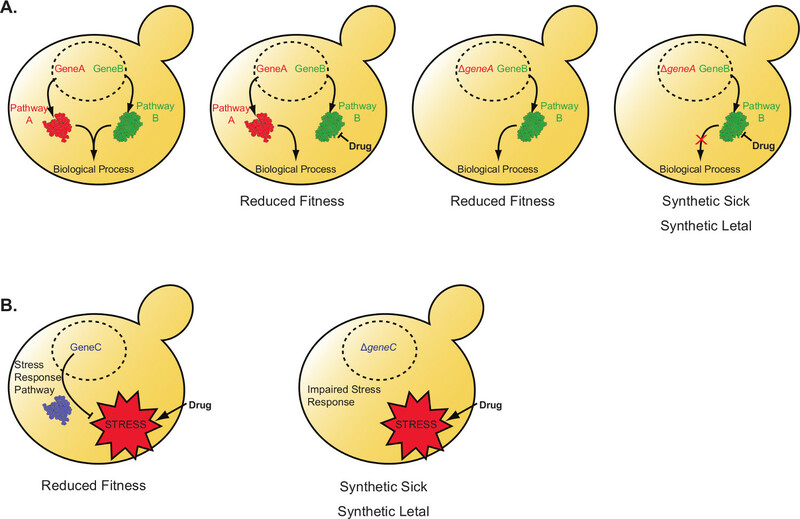 Genetic mutants that are viable individually, but lethal in combination, signal connected or convergent parallel biological pathways and form genetic interaction networks that describe biological function. With the development of conditional temperature-sensitive and hypomorphic alleles of essential genes the technology has not been limited to the study of non-essential genes3,4. This concept has been applied at a genomic scale producing an unbiased genetic interaction map illustrating how genes involved in similar cellular processes cluster together5. Chemical perturbations of genetic networks mimic gene deletions (Figure 1)6. Querying growth-inhibitory compounds against a high-density array of deletion strains for hypersensitivity identifies a chemical-genetic interaction profile, i.e. a list of genes that is required to tolerate chemical stress. Like genetic interactions, large-scale screens of chemical libraries have shown that compounds with a similar mode of action cluster together7. Therefore, by establishing the chemical-genetic interaction profile of a compound the mode of action may be inferred by comparing it with large-scale synthetic genetic and chemical genetic interaction datasets8,9. Large-scale chemical-genetic screens, where scores of compounds are interrogated, have been performed by barcode competition assays. In this approach, the pooled collection of deletion strains is grown en masse for several generations in a small volume of media containing a chemical. Since each deletion mutant harbors a unique genetic barcode, the viability/growth of individual mutants within the pool of deletion strains is tracked by microarray or high-throughput sequencing10. Inferring fitness by monitoring colony size of physically arrayed mutants grown on solid agar containing a bioactive compound is also an effective method to identify chemical-genetic interactions11,12. This approach provides a cost-effective alternative to competition-based screening and is well suited for assaying small libraries of chemicals. Outlined here is a simple methodology for producing a list of chemical-genetic interactions in S. cerevisiae that does not rely on molecular biology manipulations or infrastructure. It requires only a yeast deletion collection, a robotic or manual pinning apparatus, and freely available image analysis software. NOTE: The general workflow of this procedure is outlined in Figure 2. NOTE: The yeast-extract-peptone-dextrose growth media (YEPD) used in this protocol is a standard recipe13. Streak out BY4741 (MATahis3Δ1 leu2Δ0 met15Δ0 ura3Δ0) cells on a YEPD agar plate and incubate for 48 hr at 30 °C or until visible colonies form. Prepare overnight cultures by inoculating 5 ml of YEPD liquid media in a sterile culture vessel with a single colony. Incubate overnight at 30 °C with continuous rotation or shaking. The culture will typically reach saturation by the morning (~2 × 108 cells/ml). Prepare several stocks of the chemical to be tested at 100x desired final concentration in an appropriate solvent. NOTE: Effective concentrations will depend on the chemical, and must be determined empirically. It is therefore advisable to initially test a broad final concentration range; i.e., from low µM to high mM. For each concentration of chemical to be tested, aliquot 3 ml of molten YEPD agar to a several sterile culture tube. Place in 55 °C water bath to keep from solidifying. For each concentration of chemical to be tested add 30 µl of the 100x compound to molten media, vortex 2-3 sec to mix, and pipette 1 ml into each pair of duplicate wells in a 12-well plate. Be sure to include a vehicle only control. Allow plates to set overnight at room temperature. Discard any extra media. Inoculate 10 ml of YEPD liquid media with 2 µl of a saturated yeast culture, grown overnight as in Step 1.1.2. Plate 25 µl of diluted yeast culture per well, spread evenly using sterile glass beads or rod, and allow the plate to dry under a flame. Incubate plate at 30°C for 48 hr. Evaluate the growth of yeast (both total number and size of colonies) on the plates. Select a sub-lethal concentration of compound that does not inhibit growth by greater than 10%-15% to perform the screen. For a detailed description on constructing deletion mutant arrays from glycerol stocks please refer to Baryshnikova et al.14. Once deletion mutants have been arrayed at a density of 384 colonies per plate, the DMA can be stored for several months at 4 °C. Replicate on YEPD agar containing 200 µg/ml of G418 as necessary to prevent colonies from growing into each other. NOTE: Multiple serial replications should be avoided to prevent loss of slow growing strains and minimize the appearance of suppressor mutants. This is particularly relevant if maintaining the collections as haploids. Perform all replica-plating steps using a microbial arraying robotic system. Alternatively, manipulate arrayed colonies using manual pinning tools. NOTE: The yeast deletion collection is available as haploids and diploids from several commercial sources and is typically shipped as glycerol stocks in 96-well plates. Prepare 250 ml of YEPD agar media containing 200 µg/ml of G418. The effective concentration of G418 may vary and each lot should be tested empirically. Prepare five YEPD agar plates by pouring 50 ml of YEPD agar containing 200 µg/ml of G418 per plate. Do this one day before condensing the array and allow the plates to cool at room temperature overnight on a flat even surface. NOTE: Four plates will be required for the collection at 1,536-strain density, the fifth plate is poured as an extra. Remove the 16 Petri dishes containing the mutant deletion collection at a density of 384 colonies per plate and allow to come to room temperature (~1 hr). Wipe any condensation that has formed on the lid of each plate using a delicate task wipe. Failure to do so may result in water droplets being deposited on the array and cross contamination of arrayed mutants. Using a microbial array pinning robot, condense the DMA from a density of 384 colonies per plate (16 Petri dishes) to 1,536 colonies per plate (4 Petri dishes). Perform this so that the 1st colony from plate 1 pins to row 1 column 1 of the condensed array, the 1st colony of plate 2 to row 1 column 2, the 1st colony of plate 3 to row 2 and column 1, and the 1st colony of plate 4 to row 2 column 2. Incubate the consolidated array at 30°C overnight. Examine the array to ensure uniform transfer of colonies from source plates. There will be several blank positions, purposely incorporated into the array, which serve as a guide to ensure the DMA has been condensed correctly (Figure 4A). NOTE: These will be the source plates for replica plating onto media containing the test compound. A single source plate can be used for multiple pinnings. Also many robots will have an offsetting feature, which will ensure similar numbers of yeast are being transferred each time. Prepare 700 ml of control (vehicle only) and 700 ml of experimental media (chemical-containing). This is enough for performing the assay in triplicate (12 plates per condition, plus two extras). Pour 50 ml of YEPD agar containing test chemical or control per plate. Allow the plates to cool at room temperature overnight on a flat even surface. Using the robot to replica plate, inoculate the DMA onto three sets of plates containing chemicals at the experimentally determined concentration, as well as three sets of plates containing the vehicle control. Incubate plates at room temperature for 24-48 hr. Remove plates from incubator and allow them to come to room temperature (~1 hr) prior to imaging. This will prevent condensation from forming while imaging the plates. Image plates at 24 and 48 hr by removing the lid and placing face down on a flat bed scanner. Capture images at a resolution of at least 300 dpi. Alternatively, use a digital camera to capture images. If doing so, place plates face up on a dark background and remove the lids to image. NOTE: The file format and positioning of plates will depend on the quantification program used. Perform quantification and comparison of array colony sizes using one of several open source programs, including Balony 15, SGAtools 16, and ScreenMill 17. NOTE: At this stage several yeast deletions mutants will score as hypersensitive to the chemical of interest. These chemical-genetic interactions must next be validated in two ways. First the identity of sensitive strains should be confirmed by PCR. Second, chemical sensitivity must be independently scored. Outlined below is a brief protocol for performing spotting assays to validate strain hypersensitivity, a technique common in yeast biology. Streak out desired (hypersensitive) mutants from the yeast deletion collection onto YEPD agar containing 200 µg/ml of G418. Incubate at 30 °C until colonies form. Verify the genotype of the strain by diagnostic PCR with primers according to the manufacturer’s protocol. Inoculate 5 ml of the YEPD liquid for each strain and incubate overnight at 30 °C with rotation or shaking. Measure OD600 and dilute each strain to OD600 = 1 in sterile dH2O. These are now the normalized yeast cultures. Dispense 100 µl of normalized wild-type yeast (BY4741) culture to well A1 of a 96-well plate. Dispense 100 µl of up to seven additional strains to wells B1-H1. Use a multichannel pipettor to dispense 90 µl of sterile dH2O to wells A2-H2 through A6-H6. Finally, prepare a series of 1:10 dilutions of normalized yeast cultures. Start by serially pipetting 10 µl of column 1 to column 2 with a multichannel pipettor, and continue across the 96-well plate until six dilutions are made (i.e., 100 to 10-5). Transfer 2-5 µl of diluted yeast cultures in a grid using a multichannel pipettor onto YEPD solid media containing chemical and vehicle control. Incubate plates at the appropriate temperature for 24-48 hr. Inspect plates and compare the sensitivity of select mutants to chemical (relative to BY4741 control). Image plates at 24 and 48 hr as in step 3.2. NOTE: While the identification of several hypersensitive strains with related gene ontologies or functions lends confidence to the validity of the screen, transformation of a hypersensitive deletion strain with a plasmid containing a wild-type copy of the gene is required to formally establish that a gene deletion of interest (and not hidden second site mutations) causes drug sensitivity. As a validation of this approach we performed a representative chemical genetic interaction screen of the chemotherapeutic agent 5-fluorouracil (5-FU) following the above outlined protocol. 5-FU is known to disrupt thymidylate synthase as well as DNA and RNA metabolism18. 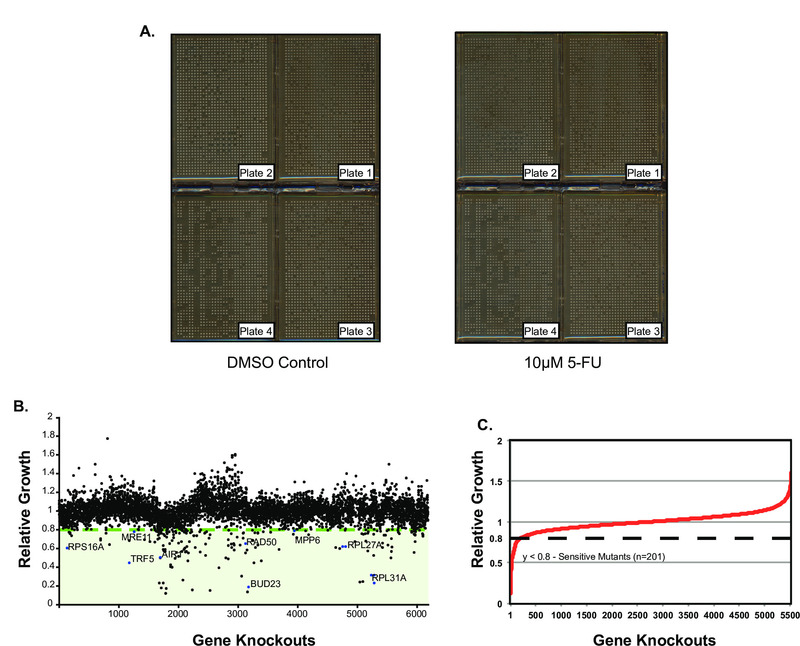 The chemical genetic interactions of 5-FU are well studied and have been investigated by yeast barcode microarray techniques using both heterozygous and homozygous deletion collections8,19. Here we show that similar results can be obtained by comparative quantitation of mutant colony size. It should be noted that the screen performed utilizes the non-essential haploid gene deletion collection. This type of screen can also be performed using diploid strains, temperature-sensitive mutants, and hypomorphic alleles, allowing the inclusion of essential gene mutants. One advantage to utilizing the haploid deletion collection is increased drug sensitivity of target pathways, given the complete absence of the gene product. However, two significant disadvantages are that essential gene hypersensitivity cannot be queried, and the haploid collection is prone to spontaneous suppressor mutations that are selected for over multiple propagations. This can lead to deterioration of the collection. Thus, there is an inherent trade off between the integrity and breadth of the array and sensitivity to drug effect. This must be taken into consideration and the most appropriate mutant collection selected based on the desired application. 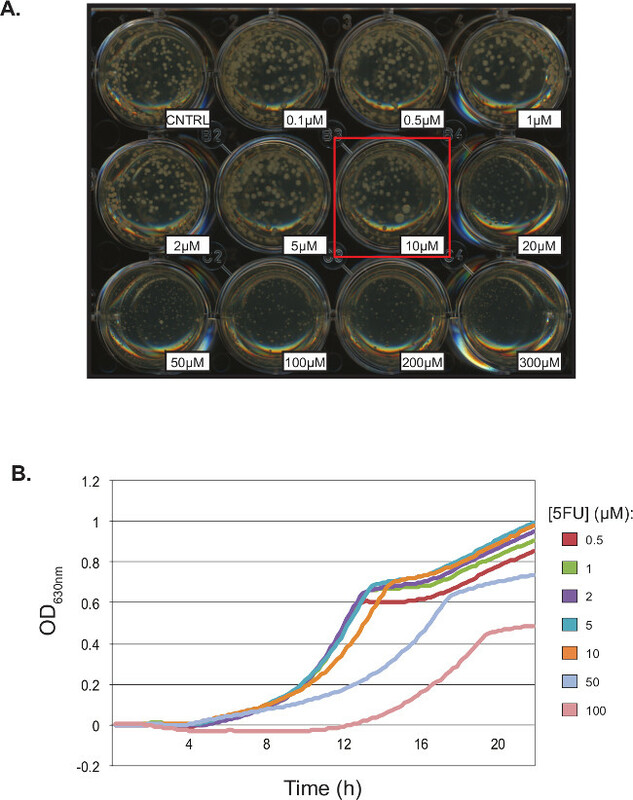 First, the appropriate sub-lethal concentration of 5-FU to be used in the screen was determined to be 10 µM by growing BY4741 (MATahis3Δ1 leu2Δ0 met15Δ0 ura3Δ0) cells on increasing concentration of 5-FU and visually evaluating yeast colony growth (Figure 3A). Alternatively, similar results can be obtained by growing yeast in microtiter plates in liquid culture and frequent monitoring of the cultures optical density using a microplate reader (Figure 3B), as outlined by previous groups10,20. Using the Singer ROTOR, the yeast DMA was replicated at 1,536 colonies per plate density onto media containing 10 µM 5-FU or a dimethyl sulfoxide (DMSO) control (Figure 4A). These plates were incubated for 24 hr at room temperature and imaged on a flat bed scanner. Colony size measurement for each mutant on both experimental and control plates was performed using the Balony image analysis engine15. The Balony software calculates the size ratio of colonies on the experimental array relative to control. The user is able to set a ratio threshold and if the screen is performed in at least triplicate a p-value will be assigned for each mutant. In our representative screen mutants that showed a ratio of ≤0.8 were considered to be hits. The results of the colony quantification can be presented graphically by plotting the size ratio for each colony on the y-axis and the gene deletion ordered by array position (Figure 4B) or ratio (Figure 4C) on the x-axis. Synthetic sick/lethal mutants identified in the screen can be grouped based on functional descriptions by performing gene ontology (GO) analysis. There are several publically available tools for GO analysis of lists of S. cerevisiae genes; including Funspec21, DAVID Bioinformatics Database22,23, and the Saccharomyces Genome Database (SGD) Go Term Finder24. Gene deletions that had a ratio of less than or equal to 0.8 in the 5-FU screen were used as an input list for Funspec. Funspec accepts a list of systematic or common yeast gene names and outputs summaries of gene ontologies, functional classifications, localization, protein complexes as well as other useful classifications that are enriched in that list. The representative screen performed showed an enrichment of ontologies for RNA metabolism, including tRNA wobbles, uridine modification and RNA surveillance machinery, and response to DNA damage (Table 1). These results agree with previous studies that have shown 5-FU treatment results in the accumulation of polyadenylated noncoding RNAs, which are processed by the nuclear Trf/Rrp6/Air/Mtr4 Polyadenylation (TRAMP) exosome25. Thus these findings are in agreement with previous chemical genetic screens and the known mechanism of 5-FU bioactivity8,19. As with all high-throughput functional genomic approaches it is necessary to validate the results. To validate chemical genetic interactions yeast mutants should first be PCR-validated with primers that anneal within the target gene’s promoter and KANMX disruption cassette. Selection of strains for validation is somewhat arbitrary, however prioritizing mutants that show a strong phenotype and group functionally provides a good starting point. Next, hypersensitivity to a chemical is confirmed using spotting assays, a common approach for measuring fitness of yeast mutants. To this end, serial dilutions of yeast strains are spotted in a grid on media containing the appropriate chemical dose as well as a control. As an example, we confirm the chemical genetic interaction of 5-FU with air1 and trf5 mutants of the TRAMP complex (Figure 5). These genes encode components of the TRAMP nuclear exosome. We note that the rrp6 strain, lacking the core 3'-5' exonuclease activity of TRAMP, was lost in our lab’s high-density DMA collection. On obtaining a fresh rrp6 mutant we confirm that rrp6 and 5-FU also display a chemical genetic interaction, establishing that TRAMP activity is required to tolerate 5-FU. This illustrates that the integrity of large deletion collections may become compromised over time, making proper DMA maintenance and strain validation critical. Our screen also identified mutants in several DNA repair enzymes (including rad50, rad52 and mre11) as 5-FU sensitive. Scoring of colony size indicated the relative fitness of these mutants on 10 µM 5-FU as 0.7, 0.65, and 0.42 compared to wild type. Based on our confirmatory spotting assays (Figure 5), these values are an underestimate likely due to the limited dynamic range of fitness measurement by colony size scoring. This highlights a second reason to independently confirm interactions by serial spotting: the magnitude of some chemical genetic interactions can be underestimated in primary data analysis. Our results illustrate that a growth-based chemical genetic screen performed with ~4,800-strain haploid deletion collection, in triplicate, provides adequate resolution to confidently isolate specific chemical genetic interactions. Figure 1: Schematic Representation of Chemical Genetic Interactions. Gene deletions that result in hypersensitivity to chemical perturbation allow for the identification of biological processes targeted by a chemical. (A) Convergent pathways can be disrupted by either gene deletion (geneA) or chemically (geneB). Individually, these cellular insults can be tolerated due to the inherent redundancy in biological pathways. However, in combination cell viability is compromised resulting in either a synthetically sick or lethal phenotype. (B) Deletion of genes (geneC) critical for mitigating chemically induced stress also cause hypersensitivity and indicate biological pathways disrupted by chemical treatment. Please click here to view a larger version of this figure. Figure 2: Workflow for Chemical Genetic Screen. (A) Determination of sub-inhibitory dose: Parental yeast strains are grown to stationary phase, diluted 1:5,000, and spread plated on solid YEPD media containing increasing chemical dose. The highest concentration having no greater than 10-15% growth inhibition is selected for screening against the DMA. (B) Systematic Chemical Genetic Screen: Using a high-throughput array pinning robot the S. cerevisiae DMA is replica plated onto media containing the appropriate concentration of test chemical. Plates are incubated at room temperature for 24-48 hr, imaged, and relative colony size determined. Please click here to view a larger version of this figure. Figure 3:. Determination of Sub-Inhibitory Concentration. (A) Growth of BY4741 cells on solid media containing 5-fluouracil. Saturated BY4741 culture diluted 1:5,000 and plated on increasing concentrations of 5-fluorouracil. (B) Growth curve of BY4741 cells in liquid media containing 5-flurouracil. ~4 × 104 cells were deposited in triplicate in increasing concentrations of 5-FU and ODs were measured every 10 min for 22 hr. Figure 4: Chemical Genetic Screen of 5-Fluorouracil. 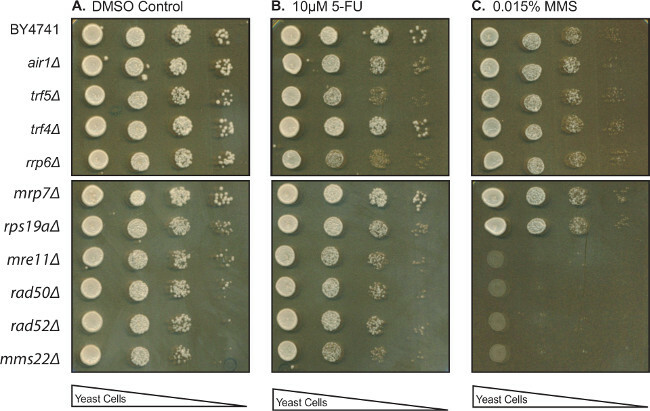 (A) S. cerevisiae deletion mutant array replicated on YEPD agar containing 10 µM 5-FU (right) and DMSO control (left). (B) Results of Chemical Genetic Screen: Relative growth of mutants on 10 µM 5-FU compared to DMSO control ordered by array position. (C) Relative growth of mutants on 10 µM 5-FU compared to DMSO control ordered by colony size ratio. A ratio threshold of ≤0.8 is indicated on both graphs. Please click here to view a larger version of this figure. Figure 5: Validation of Chemical Genetic Interactions. Serial dilutions of several isolated mutant strains grown on DMSO Control (A), 10 µM 5-FU (B), or and 0.015% methyl methanesulfonate (MMS; C). Table 1: Gene ontology (GO) Characterization of 5-Fluorouracil Sensitive Mutants. Outlined here is an approach for generating chemical-genetic interaction profiles. The method is simple: by comparing colony sizes of each strain in comprehensive gene deletion collections in the presence and absence of a chemical, all genes needed to tolerate a chemical insult are identified. Annotation enrichment analysis of the resulting list of sensitive strains can then be used to provide insight into a chemicals mode of action. While this protocol has been optimized for budding yeast, it can also be adapted for use with other arrayed microbial deletion collections, such as the E. coli Keio collection, which has been used successfully to probe hundreds of cellular perturbations26,27. Chemical-genetic profiling in yeast and other organisms is well established. The majority of these studies have relied on competition assays that quantify pooled deletion mutants through microarray analysis or high-throughput sequencing of unique genetic barcodes. This approach has proved successful in producing robust chemical-genetic profiles of large chemical libraries. The methodology described here provides a useful alternative for chemical-genetic analysis of smaller numbers of test compounds. The assay provides a simple readout that is less cost prohibitive than high-throughput sequencing or microarray analysis and does not suffer from sequence bias. While the protocol as outlined requires a robotic instrument for colony manipulation, such systems are becoming more affordable and, alternately the protocol could be adjusted for use with manual pinning tools, examples of which have been included in the list of materials. It is important to be aware of the limitations of this approach and chemical genetic profiling in general. First, the compound must have an effect on viability in budding yeast, or the specific organism being utilized. While many fundamental biological processes and functions are well conserved amongst eukaryotes, organism specific chemical genetic interactions may vary widely, as will the uptake of chemicals into cells. It should also be noted that several deletion strains have been found to be sensitive to multiple drug treatments8. These include genes involved in drug efflux, vacuolar function, and membrane integrity. It is important to take into consideration multi-drug resistance when making conclusions with respect to direct and indirect modes of action. The screen described here was performed using the haploid deletion collection, a common approach for chemical-genetic analysis in yeast. There are now multiple collections of yeast mutants available to further aid in the determination of a chemical compound’s mode of action. This includes not only the complete homozygous and heterozygous diploid deletion collections, but also conditional temperature-sensitive essential gene mutants, the Decreased Abundance by mRNA Perturbation (DAmP) yeast mutant library, and a synthetic histone H3 and H4 mutant collection, which could be used to investigate epigenetic based molecular therapies 3,4,28, Given the incredible depth of the tools available, the ease of the methodology, and the limited infrastructure required, this approach provides an accessible format to access rich functional information with respect to the mechanism of a chemical compound. Research in the CJN lab is supported by operating grants from NSERC, the Canadian Cancer Society Research Institute (CCSRI), and the Canadian Breast Cancer Foundation (BC-Yukon Branch). Dextrose Anachemia 31096-380 For YEPD liquid/solid media add to 2% final concentration (w/v) — do not autoclave. Prepare 20% stock solution, filter sterilize, and add to media after autoclaving. G418 A.G. Scientific Inc. G-1033 Prepare 1,000x stock at 200 mg/ml in dH2O and filter sterilize. Fully Automated Robtic Systems S&P robotics http://www.sprobotics.com Several automated colony handling robitic and imagining systems available. Manual Pinning Tools V&P Scientific http://www.vp-scientific.com Handheld replication tools and accessories. Giaever, G., et al. Functional profiling of the Saccharomyces cerevisiae genome. Nature. 418, 387-391 (2002). Winzeler, E. A., et al. Functional characterization of the S. cerevisiae genome by gene deletion and parallel analysis. Science. 285, 901-906 (1999). Breslow, D. K., et al. A comprehensive strategy enabling high-resolution functional analysis of the yeast genome. Nat Methods. 5, 711-718 (2008). Li, Z., et al. Systematic exploration of essential yeast gene function with temperature-sensitive mutants. Nat Biotechnol. 29, 361-367 (2011). Parsons, A. B., et al. Integration of chemical-genetic and genetic interaction data links bioactive compounds to cellular target pathways. Nat Biotechnol. 22, 62-69 (2004). Parsons, A. B., et al. Exploring the mode-of-action of bioactive compounds by chemical-genetic profiling in yeast. Cell. 126, 611-625 (2006). Hillenmeyer, M. E., et al. Systematic analysis of genome-wide fitness data in yeast reveals novel gene function and drug action. Genome Biol. 11, R30 (2010). Smith, A. M., et al. Competitive genomic screens of barcoded yeast libraries. J Vis Exp. (54), (2011). Bowie, D., Parvizi, P., Duncan, D., Nelson, C. J., Fyles, T. M. Chemical-genetic identification of the biochemical targets of polyalkyl guanidinium biocides. Organic & Biomolecular Chemistry. 11, 4359-4366 (2013). Alamgir, M., Erukova, V., Jessulat, M., Azizi, A., Golshani, A. Chemical-genetic profile analysis of five inhibitory compounds in yeast. BMC Chem Biol. 10, (6), (2010). Amberg, D. C., Burke, D., Strathern, J. N. Cold Spring Harbor Laboratory. Methods In Yeast Genetics: A Cold Spring Harbor Laboratory Course Manual. Cold Spring Harbor Laboratory Press. Cold Spring, NY. (2005). Baryshnikova, A., et al. Synthetic genetic array (SGA) analysis in Saccharomyces cerevisiae and Schizosaccharomyces pombe. Methods Enzymol. 470, 145-179 (2010). Young, B. P., Loewen, C. J. Balony: a software package for analysis of data generated by synthetic genetic array experiments. BMC Bioinformatics. 14, 354 (2013). Wagih, O., et al. SGAtools: one-stop analysis and visualization of array-based genetic interaction screens. Nucleic Acids Res. 41, W591-W596 (2013). Dittmar, J. C., Reid, R. J., Rothstein, R. ScreenMill: a freely available software suite for growth measurement, analysis and visualization of high-throughput screen data. BMC Bioinformatics. 11, 353 (2010). Longley, D. B., Harkin, D. P., Johnston, P. G. 5-fluorouracil: mechanisms of action and clinical strategies. Nat Rev Cancer. 3, 330-338 (2003). Lum, P. Y., et al. Discovering modes of action for therapeutic compounds using a genome-wide screen of yeast heterozygotes. Cell. 116, 121-137 (2004). Toussaint, M., Conconi, A. High-throughput and sensitive assay to measure yeast cell growth: a bench protocol for testing genotoxic agents. Nat Protoc. 1, 1922-1928 (2006). Robinson, M. D., Grigull, J., Mohammad, N., Hughes, T. R. FunSpec: a web-based cluster interpreter for yeast. BMC Bioinformatics. 3, 35 (2002). Huang da, W., Sherman, B. T., Lempicki, R. A. Systematic and integrative analysis of large gene lists using DAVID bioinformatics resources. Nat Protoc. 4, 44-57 (2009). Huang da, W., Sherman, B. T., Lempicki, R. A. Bioinformatics enrichment tools: paths toward the comprehensive functional analysis of large gene lists. Nucleic Acids Res. 37, 1-13 (2009). Hong, E. L., et al. Gene Ontology annotations at SGD: new data sources and annotation methods. Nucleic Acids Res. 36, D577-D581 (2008). Fang, F., Hoskins, J., Butler, J. S. 5-fluorouracil enhances exosome-dependent accumulation of polyadenylated rRNAs. Mol Cell Biol. 24, 10766-10776 (2004). Baba, T., et al. Construction of Escherichia coli K-12 in-frame, single-gene knockout mutants: the Keio collection. Mol Syst Biol. 2, 0008 (2006). Nichols, R. J., et al. Phenotypic landscape of a bacterial cell. Cell. 144, 143-156 (2011). Dai, J., et al. Probing nucleosome function: a highly versatile library of synthetic histone H3 and H4 mutants. Cell. 134, 1066-1078 (2008).